Since I was a child, I’ve loved Peanut Butter, the crunchy kind. Love it On warm toast, on bagels, in cookies, mixed with chocolate, it didn’t matter. Funny thing is, I was never a fan of PB & J sandwiches, so my brother and I came up with our own guilty pleasure during a summer game of Crazy Kitchen — PB & P, also known as peanut butter and pickle. Don’t knock it till you try it!! I used natural peanut butter and when we eat them, you wouldn’t notice the difference. So yummy. Combine flour, baking soda and salt in a medium bowl. Set aside. Cream butter with both sugars until smooth. Add eggs one at a time and beat well, then mix in peanut butter. Ensure that it is well mixed. Gradually add in the flour mixture and blend well. Using a small ice cream scoop, scoop dough and place balls 2 inches apart on cookie sheets which were lined with parchment paper. If you do not have an ice cream scoop, just roll the dough into 1-inch balls. Flatten the balls with a fork in a crisscross design. 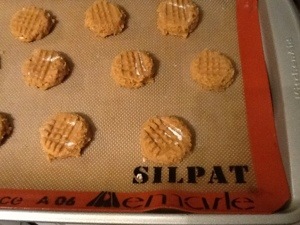 Place on centre oven rack and bake for 8 to 10 minutes, until the cookies brown slightly on the edges and puff up. Remove cookies from oven and let them cool on the pan for 1 minute before transferring to a wire rack to cool. Store in a sealed container for a week or freeze them. I like to use crunchy natural peanut butter but smooth works just as well. 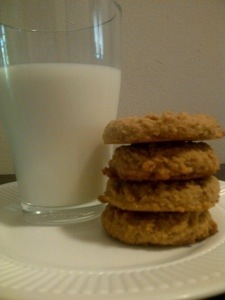 Enjoy them with a cold glass of milk.